Citation UROCHLOA ARIZONICA (Lamson-Scribner & Merrill) Morrone & Zuloaga, Darwiniana 32: 61. 1993. Basionym: Panicum arizonicum Lamson-Scribner & Merrill 1901. Type: ARIZONA: Cochise Co.: Camp Lowell, 1881, Pringle 465 (holotype: US; isotypes: NY; US). Brachiaria arizonica Brachiaria arizonica (Lamson-Scribner & Merrill) S. T. Blake, Proc. Roy. 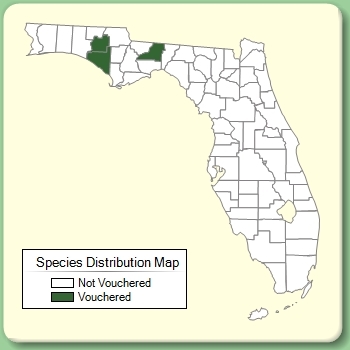 Soc. Queensland 81: 4. 1969. BASIONYM: Panicum arizonicum Lamson-Scribner & Merrill 1901. Panicum arizonicum Panicum arizonicum Lamson-Scribner & Merrill, Circ. Div. Agrostol., U.S.D.A. 32: 2. 1901. TYPE: ARIZONA: Cochise Co.: Camp Lowell, 1881, Pringle 465 (holotype: US; isotype: NY; US). Brachiaria arizonica var. laeviglumis Brachiaria arizonica (Lamson-Scribner & Merrill) S. T. Blake, var. laeviglumis (Lamson-Scribner & Merrill) Beetle, Phytologia 52: 13. 1982. 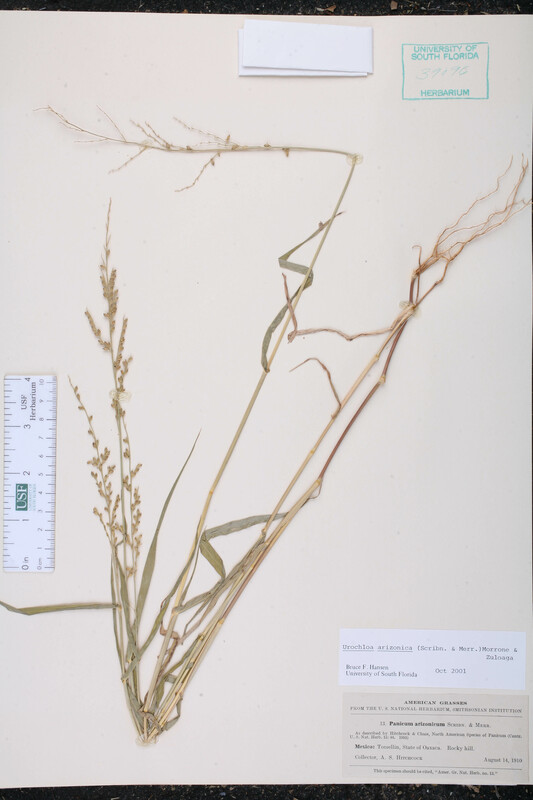 BASIONYM: Panicum arizonicum Lamson-Scribner & Merrill, var. laeviglume Lamson-Scribner & Merrill 1901. Brachiaria arizonica var. major Brachiaria arizonica (Lamson-Scribner & Merrill) S. T. Blake, var. major (Vasey) Beetle, Phytologia 52: 12. 1982. BASIONYM: Panicum fuscum Swartz, var. major Vasey 1889. Brachiaria arizonica var. tenue Brachiaria arizonica (Lamson-Scribner & Merrill) S. T. Blake, var. tenue (Lamson-Scribner & Merrill) Beetle, Phytologia 52: 13. 1982. 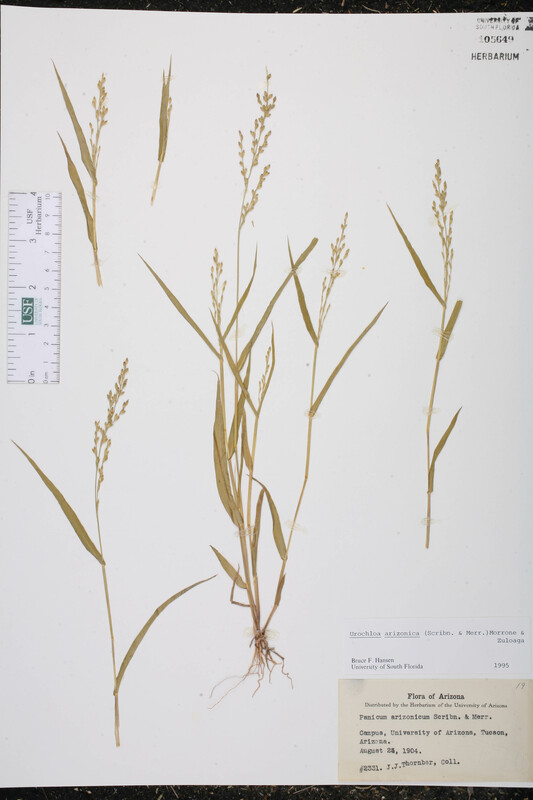 BASIONYM: Panicum arizonicum Lamson-Scribner & Merrill, var. tenue Lamson- Scribner & Merrill 1901. Panicum arizonicum var. 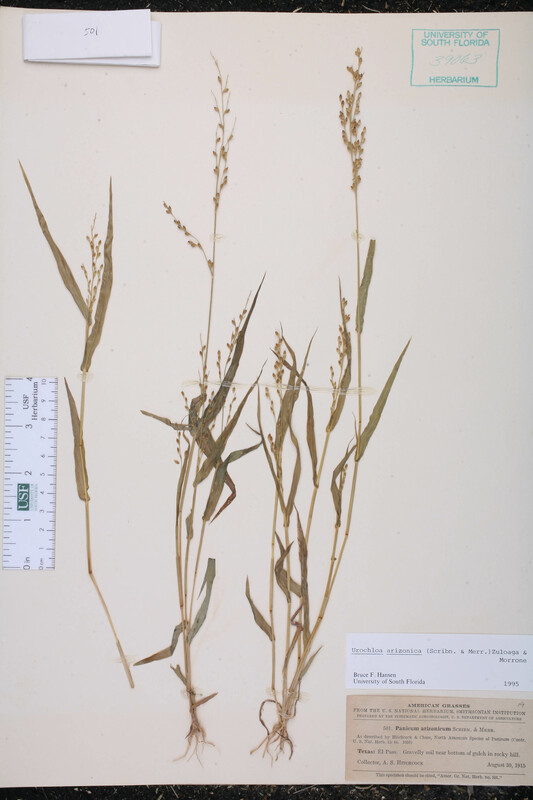 laeviglume Panicum arizonicum Lamson-Scribner & Merrill, var. laeviglume Lamson-Scribner & Merrill, Circ. Div. Agrostol., U.S.D.A. 32: 3. 1901. TYPE: ARIZONA: Cochise Co.: Mescal, Oct 1900, Griffiths 1810 (holotype: US). Panicum arizonicum var. major Panicum arizonicum Lamson-Scribner & Merrill, var. major (Vasey) Lamson-Scribner & Merrill, CIrc. Div. Agrostol., U.S.D.A. 32: 3. 1901. BASIONYM: Panicum fuscum Swartz, var. major Vasey 1889. Panicum arizonicum var. 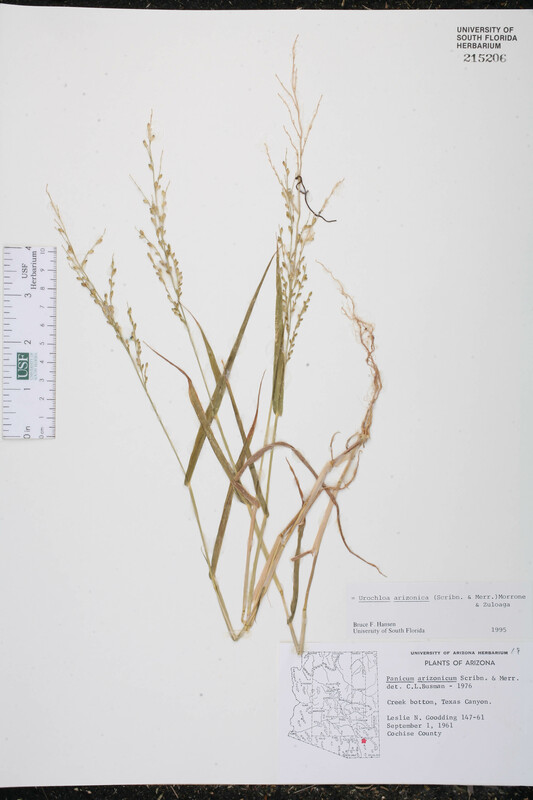 tenue Panicum arizonicum Lamson-Scribner & Merrill, var. tenue Lamson-Scribner & Merrill, Circ. Div. Agrostol., U.S.D.A. 32: 3. 1901. TYPE: ARIZONA: Cochise Co.: Fort Huachuca, 1894, Wilcox s.n. (holotype: US). Panicum dissitiflorum Panicum dissitiflorum Vasey, Proc. Amer. Acad. Arts 24: 80. 1889. TYPE: MEXICO: Sonora: Guaymas, 1887, Palmer 159 (lectotype: US; isolectotypes: US(4 shts)). Lectotypified by Hitchcock & Chase, Contr. U.S. Natl. Herb. 15: 44. 1910. 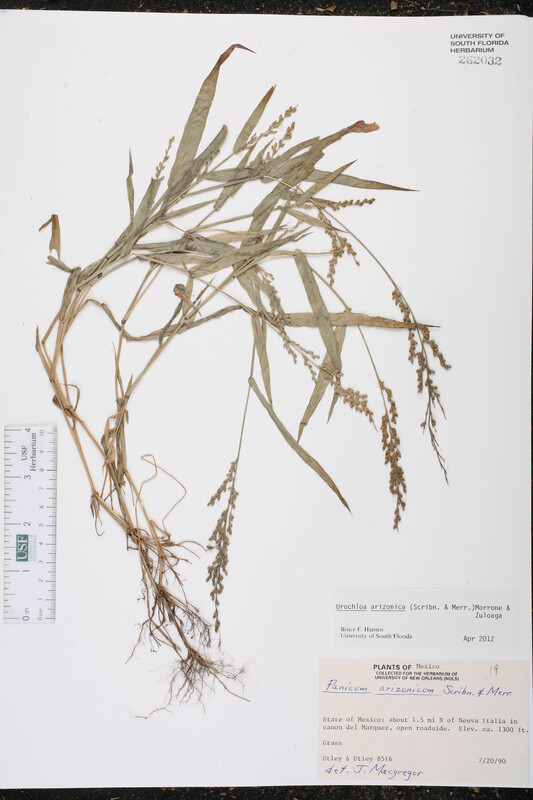 Panicum fasciculatum var. major Panicum fasciculatum Swartz, var. major (Vasey) Beal, Grass. 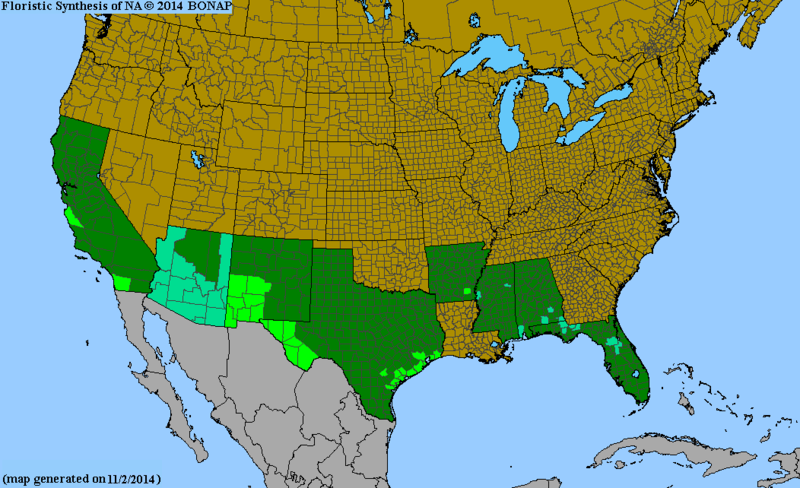 N. Amer. 2: 117. 1896. BASIONYM: Panicum fuscum Swartz, var. major Vasey 1889. Panicum fuscum var. major Panicum fuscum Swartz, var. major Vasey, Bull. Div. Agrostol., U.S.D.A. 8: 26. 1889. TYPE: MEXICO: Chihuahua: Without locality, Aug-Nov 1885, Palmer 1b holotype: US).